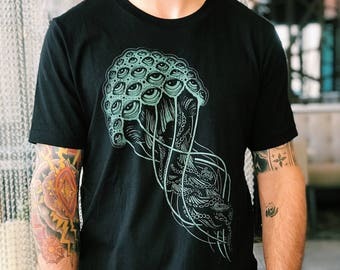 This style is a classic fit crew neck tee, hand printed with hand drawn artwork. Each stage of the design and printing process is done by hand in the Brain Candy Ink studio, using eco friendly water based inks. A classic fit crew neck men's shirt that fits true to size. Orchid purple colored blended tee that is ultra soft and drapes really nicely on the body. It is light and breathable.